Wow! Where has this year gone? We are now halfway through 2002. I still have much to do before the end of summer and I am sure most of you feel the same way. Don't forget to stop every once in a while and take some time for yourself. And no, it's not time wasted. Relaxing, doing something fun, or just doing nothing revitalizes you so that when you get back to the real world, you have more energy and more interest in what you must do. As a result, you are more productive. Our featured website this month isTheHorse.com, "Your guide to equine health care." This is an information website and features articles on horse health and care, and up-to-date news articles that affect horses and their people. They also keep an archive of articles that is extensive, although sometimes out of date. You can subscribe to three different magazines and receive a free newsletter. You'll want to bookmark this site as an information base on horse health issues. When saddling a horse, always fasten the front or main cinch first. This holds the saddle securely in place should something spook the horse or cause him to move. The back cinch and breast collar should be fastened only after the saddle is safely secured. When unsaddling, the reverse is true. Undo the breast collar and back cinch before releasing the front or main cinch. Having a horse spook with only the back cinch fastened is a frightening and dangerous situation. When the saddle falls, it remains attached under the horse's belly. The poor horse will usually try to escape this unfamiliar and unexpected danger by kicking and trying to run, while the saddle bangs away at his legs and underbelly. He can't shake it loose and you can't get close enough to release the buckle. For the next few months, Learn All About Horses will focus not on our readers, but on the horses they love. 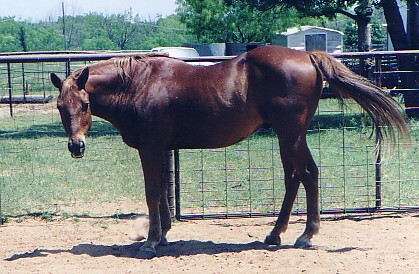 This months Favorite Horse is Sarge, a solid sorrel grade gelding of Quarter Horse ancestry. Sarge is an elderly gentlman now, being somewhere in his mid-twenties. He has a long history of helping beginning riders develop confidence, learn horsemanship skills, and just have a lot of fun being on horseback. Sarge has won the heart of many young ladies, who although grown now, still consider him their first love. And, although semi-retired, he continues to win the hearts of new riders who still find him irresistible.